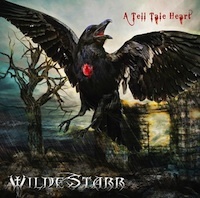 I got me self a hefty punch in the face when I listen to the intro track on Wildestarr's album 'A Tale Tell Heart'! 'Immortal' is one of the best heavy metal tracks I've heard this year. London Wilde is the gifted female vocalist in the band and she has a range in her voice in the same high class as Priest's Rob Halford. London is the song-writer in the band and together with the splendid guitarist / bass player Dave Starr and the new drummer Josh Foster they have made a metal disc in a taste to fans of band like: Primal Scream, Judas Priest and Doro. High pitch female vocals mixed with metal streaming guitars and a hard hitting drummer is the short description of the bands sound. Oddly enough their debut album from 2009 (Arrival) went completely past me, but with this new tough musical creations in their back, I have to look their first album up as well. Back to their brand new album 'A Tale Tell Heart' and the awesome song 'Immortal', which has all the good stuff you desire in heavy metal music. High speed metal drumming, screaming guitars, classy tempo changes and strong choruses that sticks in your head at once. 'Transformis Ligea' is a powerful track, which is darker and in a slower pace and the rhythm section does a marvelous job. Heavy as a cannonball of lead! These two tracks are the best on the entire album. 'A Perfect Storm' is the beginning of the so-so track line-up. I had a hard time to find any of the remaining songs to put in the same high standard as the two introducing tunes. The melodic and the power metal influences are obvious, but nothing extraordinary, which grab me by my spine. But in the slower and melodic song 'Seven Shades of Winter' something happens in my head and this is a song worth to mentioning before I close this review. It felt like a burnout in the beginning but they did a fuel rationing for the final three tracks, where you get a little extra fire again. My overall impressions are: An absolutely OK disc with one maybe two giant top tracks! Recommended for those who like high quality female vocals in the classic melodic heavy metal genre.